Senate Bill 188, Family and Medical Leave Act (FAMLI) passed out of the Finance Committee yesterday with several amendments. While we appreciate the sponsor’s receptiveness to amend the legislation, we are still troubled by how this state-run insurance program will function. There are issues with the eligibility requirements and the legislation still does not align with the federal law, making it possible for employees to stack benefits with the Federal and Medical Leave Act. The amendments offered yesterday did not resolve our apprehensions. The CRA is also concerned with the impact this legislation will have on Colorado’s small businesses. Federal law already exempts businesses with less than 50 employees where this legislation requires all employers, regardless of size, to participate. The CRA is continuing to work with stakeholders and legislators on SB 188 (FAMLI) to ensure restaurants’ concerns are heard at the Capitol. Our partners at the Colorado Chamber of Commerce released a new report on the financial risks of SB 188, which cautioned that the utilization rate of this proposal has been underestimated and could set the program up for failure. House Bill 1210, concerning the repeal of preemption on minimum wage, was heard in the Senate Committee on Business, Labor, & Technology on April 8th. Sonia Riggs, CRA President & CEO, along with CRA members Ted Politte of Pizzeria Uno and Sean Kaiser of Morning Story Restaurant testified on behalf of the industry. The CRA’s main objective is to preserve the tip credit of $3.02 across the state because the bill allows local governments to set their own minimum wages without mention of the tip credit or tipped minimum wage. We will keep you posted what occurs with HB 1210. For members that live or have businesses in Denver - YOU SHOULD BE AWARE OF TWO IMPORTANT ISSUES on the May 7th Denver Ballot. The ballots for this election will be mailed next week and we want you to be able to make informed voting decisions. This ordinance, if passed, will give anyone the right to camp indefinitely on any public property. This includes sidewalks, easements, parks, and any other piece of property that is in part or fully public. If this initiative passes it could be deemed a violation of someone’s civil rights if they are asked to move or if someone offers services to a homeless person. The CRA is very concerned about the homeless problem in Denver, but Ballot Initiative 300 is not a solution. It does NOT provide any new funding for services like shelters, job training, or address the causes of homelessness. Allowing people to sleep outside in public places permanently is not safe, healthy or helpful for the people experiencing homelessness or our community. This ordinance, if passed, would make the personal use and possession of psilocybin (hallucinogenic) mushrooms by people who are 21 years or older the lowest priority for law enforcement in the city. The CRA has been monitoring this initiative, but have NOT taken a position. However, the CRA has taken a position against the dual use of marijuana and alcohol because of potential increased liability for the restaurant. Use and possession of Psilocybin could have a similar impact. You may educate employees on issues and let them know of your position and how you plan to vote. You may also talk about how these issues may impact the business and their tips. but do not tell them how to vote. We participated with Visit Denver and CHLA in seeking the perspectives of all the municipal candidates on a range of important policy issues impacting our industry and the city as a whole. The results of that questionnaire can be found here. To find which Denver Council district you are in, click here. Join us on April 30th at the Ritz Carlton Denver for one of the most rewarding events of the year as the Foundation awards dozens of scholarships to deserving high school seniors and undergraduate students. These students will be recognized for their outstanding achievement in academics and their commitment to careers in the foodservice and hospitality industry. In addition we are honoring the Laurita Family with the Reaching for the Stars Knoebel Award, and Audra Dunleavy with the Sysco Denver Flame of Excellence Award. Additional awards include the Colorado ProStart Mentor and Teacher of the Year. Know someone who is incredible with guests and exemplifies true "Colorado Hospitality?" A person who welcomes visitors from near and far, and provides them with the best experiences possible? Then nominate them for the Colorado Tourism Office’s Top Frontline Tourism Worker Award! Each year, our tourism industry bands together to recognize outstanding tourism workers from every corner of the state in celebration of National Travel and Tourism Week.They are still looking for nominations from the Pikes Peak region, Aspen/Glenwood area, and the Eastern Plains. These individuals will get the chance to be honored and recognized through social channels, websites, industry-facing newsletters and a possible broadcast news series* during the week of May 5-11, 2019. Today is the Deadline to Submit Your Nomination! 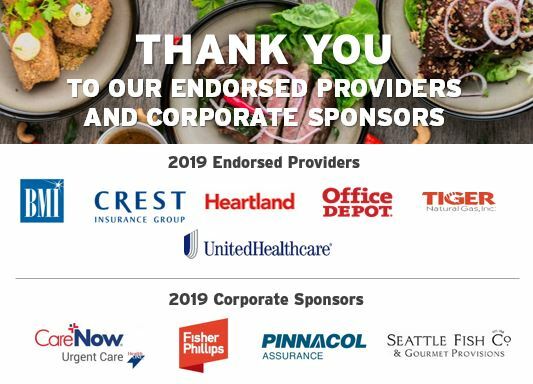 CRA is pleased to partner with many companies that support the CRA through their efforts as an Endorsed Provider or Corporate Sponsor. The CRA works hard to promote and protect Colorado’s foodservice industry, these fine companies are helping us accomplish that objective. When choosing a service provider, we hope you consider supporting those that support our industry. If you are interested in joining these folks in supporting us, please learn more here.